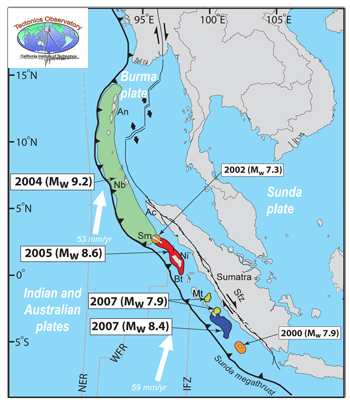 The giant 2004 Sumatra earthquake ruptured the greatest fault length of any recorded earthquake, spanning a distance of 1500 km (900 miles), or longer than the state of California. 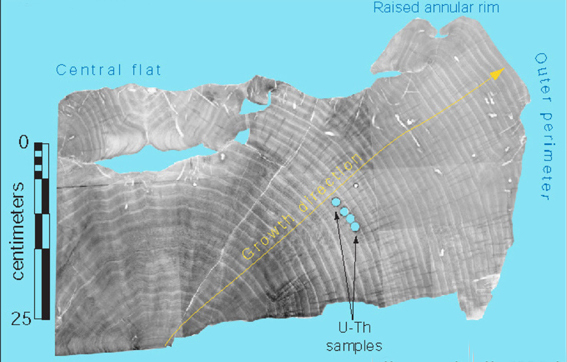 Rather than tearing the land apart all at once, the rupture started beneath the epicenter marked in the figure below and progressed northward along the fault at about 2 km/sec (1.2 miles/second). The whole rupture lasted about 10 minutes. Compare this with California's 1994 Northridge earthquake, which ruptured about 20 km (12 miles) and lasted 15 seconds. The portion of the fault that ruptured lies deep in the earth's crust, in places as much as 50 km (31 miles) below the ocean floor. 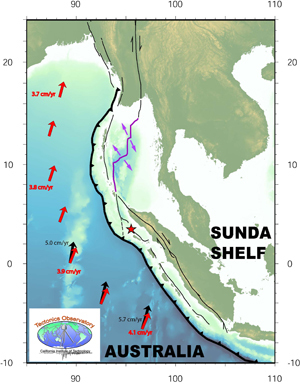 There the two tectonic plates, which had been stuck together, suddenly broke free, the upper plate sliding back upward and to the west by as much as 20 m (65 feet) along the plate boundary. 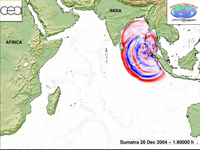 Animation of the giant 2004 earthquake rupture propagation. 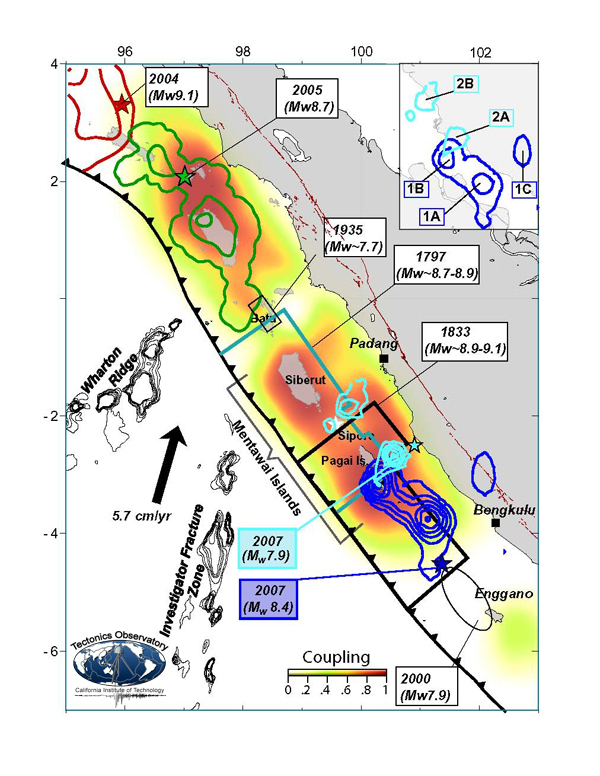 The yellow circle indicates the epicenter and the contour lines show by how much the nearby ocean floor and islands were either uplifted (red) or submerged (blue). The rupture actually took about 10 minutes. The star is the centroid, the center of energy. (Courtesy Vala Hjorleifsdottir and Santiago Lombeyda). 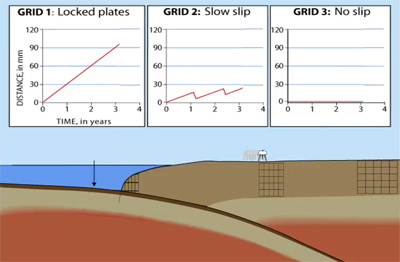 When the crustal plates slipped during the earthquake, some islands in the subduction zone grew as they were lifted above the water line, while others tipped over and partially submerged as they subsided. 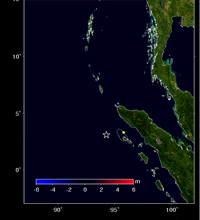 The island in Figure 2 doubled in size during the quake; the land surrounding the green area shows how much this island was uplifted. 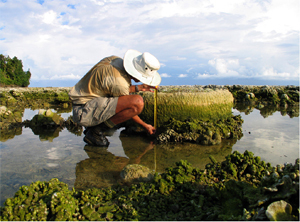 On other islands, such as that shown in Figure 3, many homes were suddently submerged as the land subsided during the quake. 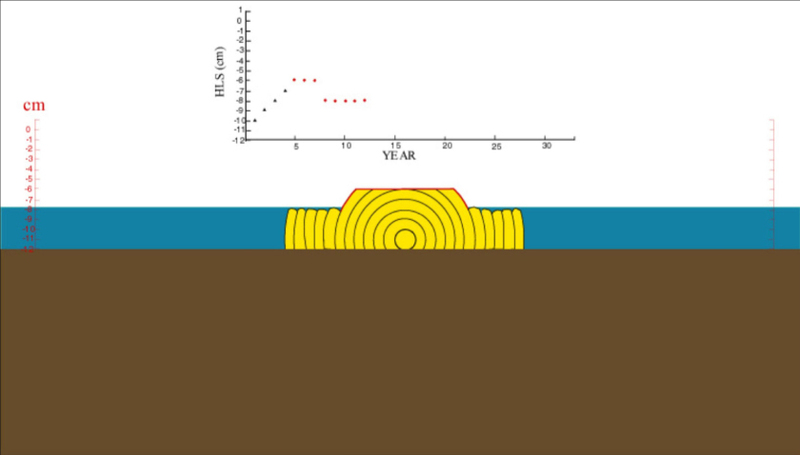 As the rupture propagated, it caused the ocean floor to spring back to the west by as much as 6 m (20 feet), as well as uplift by 2 m (6 feet). The displacement of the ocean floor was as sudden as a hiccup, and shoved the water above it upwards. 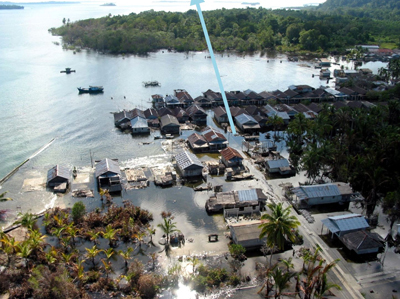 This giant push of water generated a series of tsunami waves, the first of which hit Sumatra 25 minutes after the start of the quake. The waves had grown to 100 feet (30 m) high in some places. More tsunami waves struck Thailand two hours later, and other countries around the Indian Ocean were hit a few hours later. 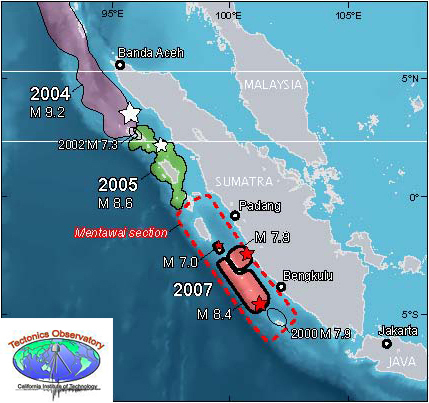 This giant quake of 2004 was followed just four months later by the magnitude 8.7 quake of March 28, 2005. 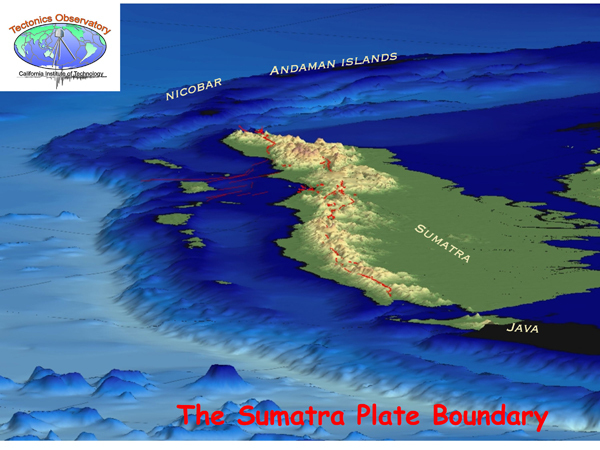 This one was west of Sumatra, under the islands of Nias and Simeulue. Although the 2005 quake was one tenth as powerful as the 2004 quake, it is still the fourth largest quake of the last 100 years, and many lives were lost. A third major quake followed two and a half years later. 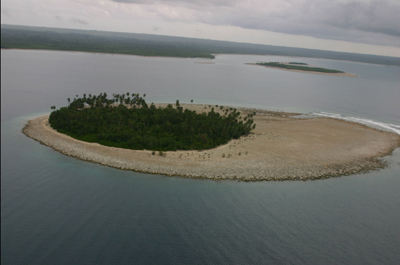 The magnitude 8.4 event of September 13, 2007 rocked the Mentawai islands. 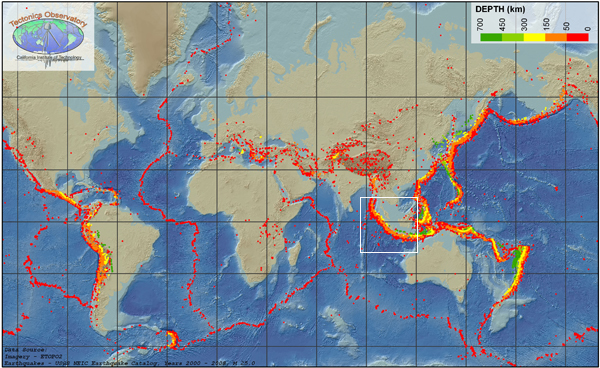 Figure 1 shows a detailed map of the rupture zones for all three of these giant quakes.